Mountains rise. Fog rolls. The plains below bake. 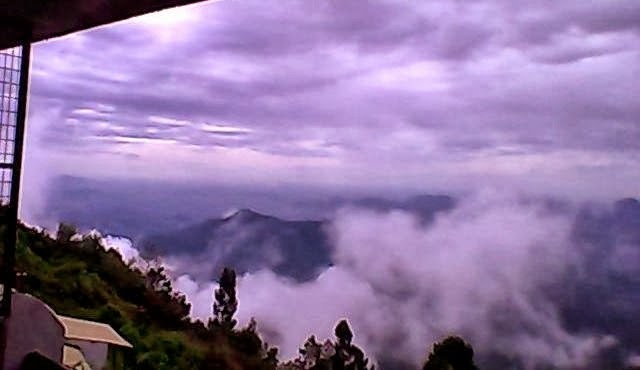 On a plateau at 2,133 metres in the Palani Hills, South India, Kodaikanal nestles in the mist. It’s a place where eucalyptus trees tower and water spills down rocky mountain facades from cascading streams. A place where cypress, acacia and fruit trees stand next to rhododendron, magnolia and dahlia. Kodai is one of India’s many ‘hill stations’ that provide respite from the summer heat below. But this station was set up by American missionaries, not the British. It boasts a beautiful, tree-lined, manmade lake and the gloriously laid out botanical gardens, Byrant Park. It is essentially a taste of small town Tamil Nadu with a tourism infrastructure and a famous international school added on. Children of the wealthy, from Europe, the US and other parts of Asia, study at Kodai International School. And there is a plush set of restaurants to support staff, students and the richer tourists, which afford Kodai a certain cosmopolitan feel. Local young women in silk sarees are to be seen walking past trendy western fashion conscious students from the international school and well-to-do tourists from Bangalore and beyond, fitted out in leggings, kurtas or Lacoste. Shops sell homemade chocolate and plant oils for various remedies. Hotels are scattered around the town, which in its most built up part boasts many quiet, narrow lanes tightly packed with small, concrete box homes and outhouses where kids make their way to or from school, women hang out washing to dry or stray dogs scavenge for food. Despite the apparent unplanned sprawl across the hillsides, the occasional garish eyesore and the tourists who bring their city habits of horn blurting and boisterousness, Kodai is still genteel by Indian standards. It’s also truly atmospheric when the mist comes rolling in across the mountains and hovers above the lake. With all the lush greenery, the abundance of fruits being grown and the chocolate box cottages dotting the slopes and around the lake, it is easy to appreciate why wealthy people retire here and the international school attracts teachers to come and live here from the US and Europe. But Kodai is not what it was. Much of the nearby forest has been felled and the vultures, foxes, wild forest chickens and other wildlife have all but disappeared. Locals say that rainfall is not as plentiful now due to water draining from the mountains, which can no longer hold it with the trees gone. Such a scenario is all too common, especially in India where a huge population puts massive stress on the environment. But this is only part of the story because something is much more fundamentally amiss in Kodaikanal. In 2001, residents of Kodaikanal uncovered a dumpsite with toxic mercury waste from a thermometer factory run by Unilever's Indian subsidiary Hindustan Lever. The 7.4 ton stockpile of crushed mercury-containing glass was found in sacks spilling onto the ground in a scrap yard. Unilever had also dumped mercury containing waste in part of the Shola forests within the company's property. Sholas are hallowed forests because of their high biodiversity and role as watersheds. The findings led to a march to the factory gates by more than 400 residents from the area and marked the beginning of a saga that is still ongoing 12 years later. The factory closed in 2001 after 18 years of operation. Air and water-borne mercury emissions have contaminated large areas of Kodaikanal and surrounding areas. A study conducted by the Department of Atomic Energy confirmed that Kodaikanal lake has been contaminated by mercury emissions. The causes were reported to be dispersal of elemental mercury to the atmosphere from improper storage and dispersal to water from surface effluents from the factory. An environmental audit commissioned by the company admitted that the estimated offsite discharge to the Pambar Shola forests is approximately 300 kg. Additionally, 70 kg were released through airborne emissions. Just one gram of mercury deposited annually in a lake can, in the long term, contaminate a lake spread over 25 acres to the extent that fish from the lake are rendered unfit for human consumption. Plant workers and Greenpeace India maintain that the company's figures of mercury discharges to the environment are grossly underestimated. Hindustan Lever has been accused of considerable legal maneuvering to avoid paying compensation to the ex-workers and their families, many of whom died or became physically handicapped as a result of mercury poisoning. Responding to claims that mercury exposure in the workplace may have damaged workers' health, the company conducted a medical check-up in March 2001. It concluded that no workers in the factory suffer from any illness which could be attributed to mercury exposure. More than 1,100 workers worked in the factory during its life-time. From their testimonies, workers appeared to know nothing about the dangers of working with mercury. There was no safety equipment for the workers and neither were there proper facilities to bathe clean after working in the factory. They were not provided with face masks to reduce their intake of mercury in the air and changed uniforms only once every three to four days. Contract workers worked with their bare hands to clean up the mercury. The workers also took home on them particles of mercury that affected the members of their family, including their children. Workers began to suffer headaches, skin rashes and spinal problems. With no knowledge about mercury, the workers failed to link their illnesses to it. Absenteeism and attrition increased over time. Some 18 ex-workers have died due to illness that can be traced to exposure to mercury. Nine children of former workers have died. Many more workers and their children continue to suffer the effects of mercury poisoning. Miscarriages and children born with congenital ailments and severe mental and physical disorders continue to be reported among the workers and their families. The fish in Kodaikanal lake are contaminated, and this has caused the loss of livelihood for many people. Water as far as Madurai, a major city about 130kms from Kodaikanal, has been contaminated. That’s no surprise because the contaminated water from the mountains was bound to flow onto the plains below. The Kodaikanal plant began production in 1983 after a mercury thermometer plant owned by Cheseborough Ponds Inc in Watertown,New York, closed and relocated to India under the ownership of Ponds India Ltd. In 1998, Ponds India merged with Hindustan Lever, the Unilever subsidiary, which imported the glass and the mercury primarily from the US and exported its thermometers to the US-based Faichney Medical Co. From there, the thermometers went to markets in the UK,Canada, Australia, Germany and Spain. In June 2007, the Madras High Court constituted an ‘expert committee’ to decide on the mercury workers’ health claims, which failed to find sufficient evidence to link the current clinical condition of the workers to past mercury exposure in the factory. The saga still drags on today. While the company has taken limited ‘too-little-too-late’ steps to clean up its former site, the wider environment of course remains contaminated. On the surface, as you take in the sights, breathe in the mountain air and smell the plant fragrances, Kodai may seem like is a pristine paradise. But here, high in the mountains of Tamil Nadu, there lurks a story that is all too common across the world: the shifting of production involving hazardous materials and methods from Western countries to cheap labour economies, resulting in the exploitation of foreign labour, in both financial and health terms, environmental destruction and flagrant criminality, which is never properly held to account. It happens because corporations cannot easily get away with such things in their home country, but, for the sake of cutting corners and added profit, think they can in places like India. ‘Bhopal’ arguably being the ultimate example. It also happens because a blind eye is turned towards corporate greed and criminality that all too often goes under the banner of ‘doing business’ or ‘offshoring’ by corporate executives and corrupt or weak-willed local officials, regardless of the impact on millions of ordinary citizens. Hindustan Unilever Limited (HUL) is an Indian consumer goods company based in Mumbai. It is owned by Anglo-Dutch company Unilever, which owns a 67% controlling share in HUL. HUL's products include foods, beverages, cleaning agents and personal care products. A list of its brands are in the Wikipedia link below. One way ordinary people can put pressure on companies for their practices is to draw attention to them by publicising them and to boycott their products, whether, in this instance, it concerns HUL in India or Unilever in other countries. What Would Our Country Look Like Without the EPA? WASHINGTON - March 26 - Today, the U.S. Environmental Protection Agency released an extensive survey reporting that more than half of our nation’s stream and river miles are severely polluted, or listed as “impaired” or in “poor condition.” This is the most dire in a string of water assessments over the last 20 years that have reported high percentages of water impairment and pollution in the United States. 1994: 36% of our streams and rivers were reported partially impaired or fully impaired. 1996: 36% of waters assessed did not meet water quality standards. Very few rivers were assessed (approximately 19%), so the reality could have been worse than reported. 1998: 40% of waters assessed did not meet water quality standards. 2000: 44% of waters assessed did not meet water quality standards. 2002: 45% of assessed rivers and streams were listed as impaired. 55% of our river and stream miles are in poor condition. 27% of the nation’s rivers and streams have excessive levels of nitrogen, and 40% have high levels of phosphorus. These nutrient pollutants cause toxic green slime outbreaks that are harmful to public health. 24% of the rivers and streams monitored were rated poor due to the loss of healthy habitat surrounding them. 9% of assessed river and stream miles were found unsafe for swimming and recreation due to high bacteria levels. More than 13,000 miles of rivers have fish with mercury levels that may be unsafe for human consumption. “The EPA and our nation’s leaders have known for years that we have a very serious dirty water problem in the United States. The more we assess, the worse the picture gets for our nation’s waterways. If you look at this grim report against several other similarly grave reports over the last 20 years, you will see that we can’t afford inaction any longer. When more than half of our nation’s waters are listed in ‘poor condition’—and these are the same waters that our families rely on for drinking water and the same streams and rivers that we enjoy for recreation—it is time for serious action. “Until our nation’s leaders commit to cleaning up our waters, our communities and families will pay the price with our health. And until we get a handle on actually regulating water pollution from the biggest industrial polluters, such as the agriculture and mining industries, every two years we will see this dreadful picture of 50 percent or more of our nation’s water grievously polluted. This is the year “to put the politics of food on the public agenda and find better solutions to the insanity of our broken food system”. More people may be shopping ethically – sales of Fairtrade cocoa grew by more than 20 per cent last year to £153m – but, according to the report, the world’s food system is “dangerously out of control”. This wave of “ag-gag” bills would criminalize whistleblowers, investigators, and journalists who expose animal welfare abuses at factory farms and slaughterhouses. Ten states considered “ag-gag” bills last year, and Iowa, Missouri, and Utah approved them. Even more are soon to follow. The bills aren’t identical, but they share common language — sometimes even word-for-word. Some criminalize anyone who even “records an image or sound” from a factory farm. Others mandate that witnesses report abuses within a few hours, which would make it impossible for whistleblowers to secure advice and protection, or for them to document a pattern of abuses. Yet these bills aren’t about violence or terrorism. They’re about truth-telling that’s bad for branding. For these corporations, a “terrorist” is anyone who threatens their profits by exposing inhumane practices that jeopardize consumer health. They are fraudulently substituting cheaper – less healthy – food for high-quality. food. And see this. Food fraud is rampant .. including huge proportions of fish. An official U.S. government report finds that Americans ‘are sicker and die younger’ than people in other wealthy nations. There are a number of factors for this sickness … but unhealthy, cheap food is part of it. WASHINGTON - February 22 - Eighteen national and state medical, public health, civil rights, environmental, and clean air groups filed a brief late Thursday with the D.C. Circuit Court of Appeals defending the U.S. Environmental Protection Agency’s Mercury and Air Toxics Standards (MATS) against industry lawsuits aimed at dismantling those rules, and blocking long-overdue reductions in highly toxic air pollutants including mercury, arsenic, chromium, nickel, and acid gases from existing coal- and oil-fired power plants. The groups assert the lawsuit has no basis, and should be dismissed. Under the 1990 Amendments to the Clean Air Act, these standards already were more than a decade overdue when the EPA finalized them in December 2011 and are based on successful control measures already in place in many plants. The NAACP has highlighted the civil rights issues related to clean air, citing the fact that 68 percent of African Americans live within 30 miles of a coal-fired power plant. Also, an African American family making $50,000 per year is more likely to live next to a toxic facility than a white American family making $15,000 per year. Coal- and oil-fired power plants are the largest industrial source of air toxics, annually emitting more than 386,000 tons of 84 separate toxics, including arsenic, cadmium, chromium, nickel, selenium, acid gases, and mercury. Even in small doses these pollutants cause serious, often irreversible risks of cancer, birth defects, neurodevelopmental problems in children, and chronic and acute health disorders to people’s respiratory and central nervous systems including nerve and organ damage. They also cause serious harms to wildlife, including reproductive and behavioral disorders, and to ecosystems, including acidification of our nation’s waterways. Power plants account for approximately half of all the nation’s mercury emissions. Many waters with mercury-based fish consumption advisories have no identifiable source of mercury other than airborne emissions, and many of these waters supply food to subsistence fishermen who have no other alternative but to eat contaminated fish, thereby further harming an economically disadvantaged population. Mercury exposure threatens prenatal development, infants and young children. The EPA has estimated that every year, more than 300,000 newborns may face elevated risk of learning disabilities due to exposure to toxic forms of mercury in the womb. Mercury contamination in fish also causes serious damage to wildlife. EPA’s MATS requirements will annually prevent up to 11,000 premature deaths, nearly 5,000 heart attacks and 130,000 asthma attacks. Additionally, the standards will help avoid more than 540,000 days when people have to miss work because of health problems associated with power plant pollution. These “sick” days diminish economic productivity and raise health care costs. Attorneys for the Clean Air Task Force filed the brief Thursday on behalf of the coalition of public health and environmental organizations defending the MATS rule. Groups submitting today’s legal arguments, and their counsel, are the American Academy of Pediatrics, American Lung Association, American Nurses Association, American Public Health Association and Physicians for Social Responsibility, (represented by the Southern Environmental Law Center); Chesapeake Bay Foundation, Clean Air Council, National Association for the Advancement of Colored People, and Sierra Club (represented by Earthjustice), Citizens for Pennsylvania’s Future, Conservation Law Foundation, Environment America, Izaak Walton League of America, Natural Resources Council of Maine, and Ohio Environmental Council (represented by the Clean Air Task Force), and the Environmental Defense Fund, Natural Resources Defense Council, and Waterkeeper Alliance. Astoundingly, Mr. Obama – the supreme pragmatist and compromiser – gave an inaugural address that was as strong a defense of progressivism as we have seen in thirty years. Yet it will take more than words to make a difference. As the echoes of his speech fade, we are still faced with ultra-rightwing terrorists threatening to hold the US economy hostage to a set of demands that the majority of Americans disagree with. These are the same loonies who deny global warming; the same ones who set up a museum showing prehistoric humans walking with dinosaurs; the same ones who think the answer to gun violence is more guns; the same ones who voted against relief for victims of Sandy … the same ones who want to shove ultrasound instruments into women’s vaginas and tell people who they can and cannot marry while simultaneously shouting to the rooftops about freedom and values. Yeah. Their freedoms, their beliefs and their values, please. All others step to the back of the bus, or consult Leviticus. You know, that font of ancient wisdom that tells us when and how to stone our neighbor’s daughter. Want to know how our political discourse got so mind-numbingly stupid? Well, we can start with this little fact: The press is so enamored with “balance” that they’ll treat even the most ignorant, shallow, fatuous movement – a movement composed of the selfish, the self-obsessed, the angry, the bigoted, and the blissfully ignorant – as if it were a serious movement. Consider the following signs seen at Tea Party protests. Or this: “Obama Half Breed Muslin” – or maybe cotton or linen? Or this: “Stop Illeagles.” Yup, gotta hate it when eagles get ill.
There’s absolutely no shortage of these tributes to stupidity – the list could go on and on. At one time this kind of foolishness would have been laughed off the national stage. Now it dominates one of our major political parties, thanks to the media’s embrace of balance and false equivalence and the Democrats’ silent complicity. It might be time for a whole new set of “imponderables”. Imponderables are questions or statements that by their nature expose something that doesn’t make sense. At their best, they’re mildly amusing and instructive. For example, why does Hawaii have an Interstate Highway system? or Why isn’t “phonetic” spelled the way it sounds? or Why do psychics have to ask you for your name? National “Defense:” If the US was spending more than the next 16 countries combined on defense prior to 911, why did we need to create the Department of Homeland Security to defend ourselves? Shouldn’t the Defense Department be called the Department of Offense? Why isn’t every citizen asking why we have tens of thousands of troops scattered around the world to fight the cold war, nearly 25 years after it ended. If Citizen’s United is about Free Speech, why does it cost so much? Republicans and plutocrats are set to spend far more than $1 billion on the presidential race. Why did Obama call the Patriot Act shoddy and dangerous then essentially continue Bush’s assault on the Bill of Rights? Climate Change: Why did candidate Obama call climate change an epochal man-made threat to the planet, while President Obama virtually ignored it his entire first term. Why do states which are experiencing the worst climate-related disasters elect Republican governors and congressional representatives who deny its existence? Deficit Duplicity: Why are Republicans once again threatening to shut down government over extending the debt ceiling, after voting for the Ryan’s first budget, which required multiple and astronomical increases in the debt ceiling until the year 2062? If Republicans really hate deficits, why did the last three Republican Presidents run up more than 66% of the nation's cumulative deficit – more than all other Presidents combined? And why didn’t rank and file Republicans utter a peep against it when they did? Deregulation, Trickle Down Redux, or Fool me once, shame on you … If thirty years of policies featuring deregulation, tax cuts for the rich and starve the beast policies resulted in the economic crash in 2008 – the worst since the Great Depression, which was also preceded by laissez-faire policies – how can more of the same be the solution? Small Government that Isn’t: If Republicans like small government, why does it always grow when they’re in office? Why does the press mindlessly repeat conservative fear mongers’ debt warnings even as the deficit is disappearing? There’s no shortage of political imponderables. Given the absurdity of our political process and the media’s malfeasance, our national well of stupidity is deep and wide. The answer to all these questions is simple – these absurdities exist, because our media has replaced truth, accuracy and reality with balance, false equivalency, and stenography and Democrats have been silent co-conspirators. Why? Because the press is a wholly owned subsidiary of corporations, and too many Democrats feed at the corporate trough. And that’s not funny, but it is stupid.